Meritage Steakhouse is an upscale restaurant geared for sports fanatics with flat screens tuned into the latest sporting events. Although this steakhouse appeals to sports enthusiasts, non sport enthusiasts can enjoy the atmosphere as well. Guests have the choice of outdoor seating on the fire pit or sunset patio. 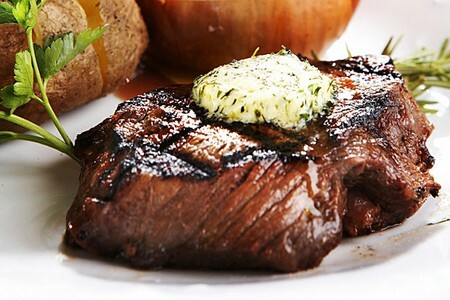 Meritage provides a hearty menu with prime steaks, chicken, and seafood. The menu offers the chef’s signature cuts which includes the Petite Filet 3 Ways and the Serrano Wrapped Beef Tenderloin. Diners can sample wines from the steakhouse’s fine wine cellar or choose half or full bottle options. From the restaurant, guests have a view of the resort’s golf course green fairways. The ambiance is inviting with some patio views that make you long to sit by the outdoor fire pit enjoying a beautiful desert evening. Staff was very knowledgable and attentive. Wine list - top notch and the friendliest bar tender in town. Even offered non-alcoholic wine. Only negative was that my steak was a bit salty. I wouldn't recommend adding any of their specialty salts to the meat. I will take clients there again!